Heat oven to 350°F. Spray 2 1/2-quart casserole with cooking spray. In 10-inch skillet, heat oil over medium-high heat. Add chicken thighs; sprinkle with garlic salt and pepper. Cook chicken 8 to 10 minutes, turning once, until golden brown and juice of chicken is clear when thickest part is cut (at least 165°F). Cook pasta as directed on package; drain. In large bowl, mix soup, half-and-half and paprika; reserve 3/4 cup sauce. Stir in cooked pasta and frozen broccoli. 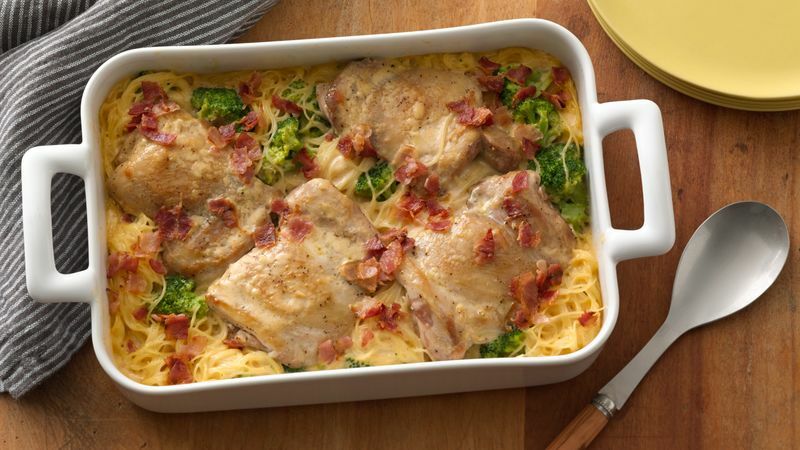 Place pasta mixture in casserole; top with chicken thighs. Spoon reserved sauce over chicken thighs. Top with bacon. Cover and bake 20 minutes; uncover and bake 10 to 15 minutes or until sauce bubbles. You can try different vegetables, such as cut green beans, corn, or thawed and drained frozen spinach. If desired, substitute boneless skinless chicken breasts for the chicken thighs.